There seems to be a big crossover between comedy and car enthusiasm, with many comedians having a unique affection for certain types of vehicles. For example, well-respected comic Jerry Seinfeld is a well-known Porsche aficionado, Indianapolis-born late night host David Letterman loves Indy racing, buff UFC commenter Joe Rogan is obsessed with American muscle, and ventriloquist Jeff Dunham likes… AMC Gremlins. No, not Gremlins, the 1984 comedy-fantasy film that sometimes airs on the movie channel AMC—we’re talking about Gremlins, the little-loved subcompact that the American Motors Corporation manufactured from 1970 to 1978. And in a way, it makes perfect sense. After all, Gremlins are to cars what ventriloquism is to comedy. To be fair, Jeff Dunham’s Gremlin “collection” is really just two cars. 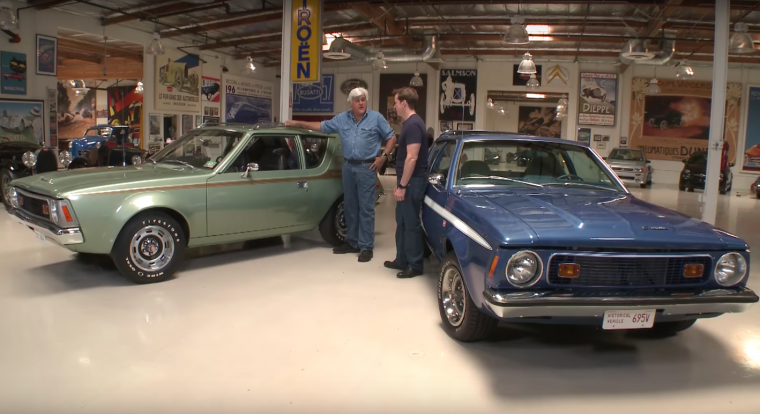 The first is a green 1972 Gremlin, and the second, even “cooler” version is a 1973 special edition Levi’s model, complete with a denim interior that suits Jay Leno like… well, like one of his many pairs of denim shirts and jeans. Jeff and Jay discuss some of he actually interesting history of the Gremlin, including the fact that the design was first sketched on an airline barf bag, and that the vehicle was introduced on April 1, 1970, as if to test the American public’s sense of humor. But who knows? Maybe the Gremlin is actually a pretty decent car! And hell, maybe Dunham’s Achmed the Dead Terrorist character is a biting and insightful commentary on our current geopolitical anxieties, and not a racist, one-note joke that only plays well in front of xenophobic audiences! Well, I don’t know about that last one, but… it’s at least worth debating, I suppose.